Looking for the perfect place for your new furry family member to stay overnight? Look no further than our home away from home – Morris Animal Inn. We are now offering additional package opportunities to ensure your puppy has an even more customized stay. We offer training, socialization, grooming and more! Puppies require special care and nurturing and the Puppy Steps Program is designed to meet these essential needs. For this crucial stage of development, we have combined lodging and activities to reinforce housebreaking, encourage play and provide comfort. This unique program is for puppies up to seven months of age. Full vaccine series must be completed prior to lodging. While your puppy is boarding, our trainer will reinforce basic manners with repetition and lots of loving positive reinforcement. Training may include a variety of learned behaviors including sit, come, leash manners and others. The more often your puppy participates in our Puppy Training Sessions, the more confident they will be as adult dogs that could be taken anywhere. Contact our Puppy Specialists today to find out how we can meet your puppy’s needs! 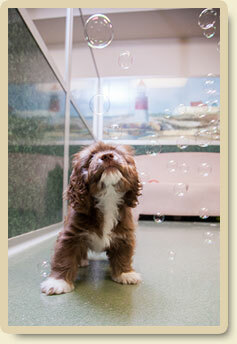 A full day of fun, learning and love in our specially designed puppy nursery! Let us help your precious puppy, aged eight to twenty weeks, begin the journey to becoming a much-loved and well-behaved member of your family. Your puppy will enjoy all that this care offers including socialization, foundations of obedience, introduction to leash walking, cuddles galore and much more!